Description: Games4King - G4K Cute Rabbit Rescue is another point and click escape game developed by Games 4 King. There were some houses in a beautiful snowy area. The snowy terrain was beautiful. There was very little temperature in that area. There was a cute rabbit living in that ice area. One day the cute rabbit was stuck in a house where there was unexpectedly. It is your duty to save the cute rabbit from there. Find clues hidden there to save that cute rabbit. 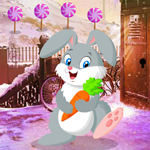 Find all the clues and rescue the cute rabbit and congratulate you to win the game. This game is highly desirable. The aim of this game is to improve knowledge. Good luck and have a fun! If you are interested in me and my ideology ,then you are invited to my bed. Thanks.